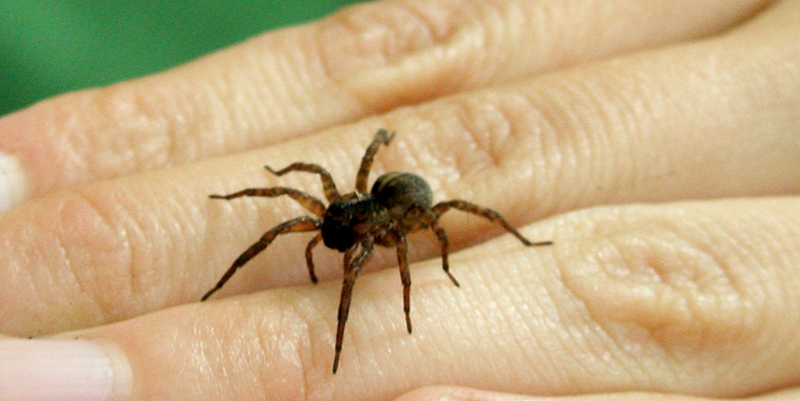 You are always within three feet of a spider: Fact or Fiction? A lovely crab spider (Thomisidae). Last week I wrote a post about the life history of Arctic wolf spiders – and in that post I discussed how some of our recent research results show wolf spider densities in Arctic tundra habitats are just under 0.5 per square metre. Morgan Jackson commented on that post, and asked about whether it was true that you are always within six feet of a spider. This is one of those common myths (along with ‘do spiders bite?). A quick scan on the Internet suggests this myth can be stated in many ways (e.g., within a metre, within six feet, within three feet, etc.) but you get the point: are you always close to spiders? . This ‘myth’ has been submitted to Mythbusters as one that the show should tackle, and ‘yahoo answers‘ has this question – some of the answers are hilarious (e.g., not when you are swimming). So…is it fact or fiction? When in doubt, let’s go look at the scientific evidence. What does the scientific literature tell us? As mentioned in my post last week, our laboratory just published a paper in the Canadian Journal of Zoology about wolf spiders in the Arctic. In this work, wolf spiders occurred at densities of close to 0.5 per square meter. In some of my own earlier work in Alberta (more shameless self-promotion! see Buddle, 2000), I estimated densities of wolf spiders (in a forest environment) to be between 0.5 and 1 per square meter. Not long ago, I had a discussion with a PhD student working in Alaska, and she also had densities estimates of wolf spiders within a similar range. 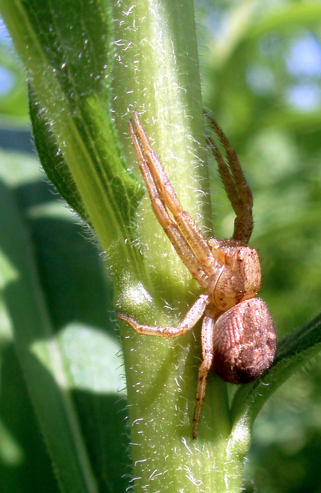 Kiss & Samu published a paper in 2000 that was about densities of wolf spiders in agroecosystems in Europe, and their estimates were at a minimum of three adults per square metre. A wolf spider (Lycosidae) – they are everywhere! Those aforementioned estimates are for one family of spiders only (the wolf spiders, Lycosidae), and wolf spiders are active and easy to see. I would argue that densities of other spider families are likely higher than wolf spiders. Most spiders are quite small and easy to miss, but they are everywhere. In a classic and seminal paper by Turnbull (1973) (all Arachnologists should read that paper!) there are a series of estimates of spider densities in a range of habitats – and these are estimates for all spiders, not just a single family. The lowest estimate he provides is from work in a Polish meadow where densities of 0.64 spiders per square metre were reported. The highest density was 842 spiders per square metre in an English pasture. Turnbull averaged all previous published estimates and ended with a mean of 130.8 spiders per square meter. Turnbull does point that it is kind of a meaningless statistic, except that it helps us tackle the question of interest: Is there always a spider within three feet of you…? So…. in most “natural” habitats, I think it is true that you are always within three feet of a spider. -spiders are terrestrial, so you are not close to spiders when you are swimming! Spiders: you gotta love them – in natural systems, they are always close to you! 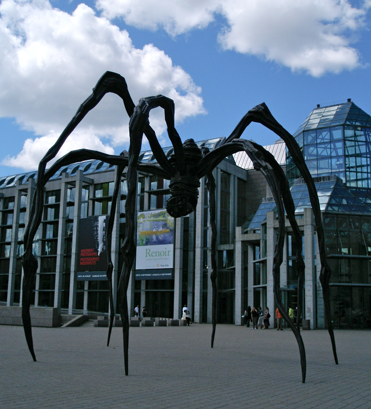 Spiders – they really are everywhere – even as sculpture. Good post, by the way. I’d seen the English survey, but not the balancing one. Those poor Polish spiders, though, making do with 5 legs each! Ha! Thanks for the comments… great post you wrote, also. Nice! Why am I just now finding out about this blog?! A no-brainer for inclusion on the exclusive BitB arthropod blogroll. This question would make a great Mythbusters episode! Maybe an entire show dedicated to arthropod myths? I am measuring spider diversity and abundance in some urban greenspaces and can tell you they are all over vacant lots, but of course, it’s mostly wolf spiders. Thanks Ted for the kind words! And, Caitlin, you are right – an entire mythbusters episode devoted to arthropods – great idea! I think vacant lots in cities provide wonderful spider habitat, and probably densities there that are comparable to open clear-cuts, tundra, etc. I’m definitely within three feet of a spider! no doubt about that, though it might have to do with my location 😀 you should come visit! This is not always true you could be sky diving! unless a spider is skydiving with you! all kind of spiders up there – that’s how they disperse. they spin a thread that gets picked up by the wind, and they parachute for hundreds of miles. The saying I heard is: “The average person comes within 3 feet of a spider everyday.” I believe that holds true. Semantics is everything.